Organisations wanting to differentiate their digital customer experience look no further! The Digital Banking Report entitled, ‘Customer Service in the Digital Age’, provides 10 strategies and tactics for organisations to do exactly that. Jim Marous, Co-Publisher of The Financial Brand and Publisher of the Digital Banking Report, says “A customer service revolution is occurring in financial services. Technology is changing the way people shop, spend, and reflect on their purchases, and as a result of this transformation, there has never been a time when customer service and the overarching customer experience has been as important as it is today. So, knowing that the digital landscape is changing, and knowing how customers react to this change, it’s in organisations’ best interests, to work out how it best serves them. The rise of digital channels, digital communication, social media, social networks and word-of-mouth across a connected universe gives us a glimpse into the power and potential to solve problems, address complaints proactively, and potentially predict outcomes before they occur. The key to using the evolving digital landscape to business advantage is in leveraging off technology that is responsive, empathetic, accessible, connected and human in the hearts, minds, and wallets of your most prized assets  your customers and your employees. Customer Service In The Digital Age gives us a snapshot of the 10 digital customer care rules that are the foundation for an improved customer experience in the future. 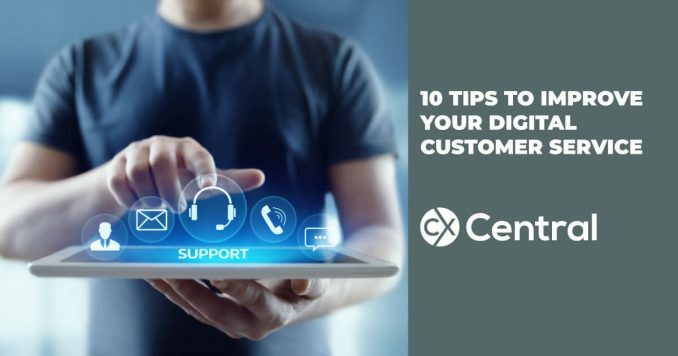 These tips to improve your digital customer experience will deliver benefits for both your business and the customer. Bankers hours are part of a bygone era. Customers expect to be able to connect with you when they want to, using the channel of their choice and you must be able to return their communication quickly. The main thing to remember here is that digital customer service needs to be always on. We are all consumers. Regardless of the mode of communication, we all define a good customer service experience as one that quickly resolves our issues or concerns. The more swiftly the problem is resolved, the better the experience. The key here is the ability to proactively respond to potential service or customer care issues. With a plethora of digital options, what’s to say that along with automatic notification to emergency personnel from some vehicles, the vehicle couldn’t notify the driver’s insurance company and bank as well? By using social media monitoring dashboards and a team of social media customer care agents, consumer issues can be resolved before a customer picks up a phone or sends an email. Again, being proactive is the key to the exceptional digital customer experience. Social media is being used increasingly to vent complaints. It is also being used by progressive organisations as a response device when customers, members or clients are unhappy. Consumers believe digital channels are best for more transactional issues and less involved tasks. Customers still prefer a phone call to handle more complex issues. The consumer expects support to be consistent even if they change channels in the middle of the resolution. As of 2014, there are more people using mobile devices than their desktop. Therefore, it is important to provide simple access to all customer care channels using a mobile device. To support the speed of response, the digital consumer will value the use of SMS functionality. This is a more impactful channel than email and can provide links to additional appropriate departments/people. It’s imperative to remember here though, that any application you expect your customers to use, needs to be user-friendly on any device. The simple truth is, those who have a bad experience are inclined to express their displeasure in more ways than those who have a good experience. Nearly one-third of disgruntled respondents will elevate their issue to a higher management level or write a negative review. Word of mouth is more powerful and prevalent than ever, with social media providing the platform to talk about experiences quickly and repeatedly. Make sure that when you’re opening your business up to the array of digital mediums, you are equipped to handle the criticism you might receive, and manage your consumers expectations. Firstly, your team needs to provide technical as well as product support to your customers and understand the devices used to access your services. With the number of device types increasing every day, your team needs technical/device training as much as product training. Secondly, the call centre of yesterday primarily dealt with English speaking customers concerning a narrow range of financial products and services. Todays call centre must communicate with a diverse customer base that speaks a variety of languages. As a result, you must hire multilingual staff. There is nothing more frustrating to a customer than to repeat a problem or introduce himself or herself multiple times during a customer care conversation. Every customer touchpoint should have a complete and updated 360-degree view of the customer as well as the issue being resolved. Real-time updating of the service conversation must occur on all channels. The key is to upsell your customer on value, not revenue. By better understanding the customers current product portfolio and areas of need, the offering of tips, tools, and tutorials can be a powerful accompaniment to the customer support conversation. To effectively become a digital customer service organisation, paper documents must be converted to digital so that insight can be more accurately and consistently collected, stored, accessed and measured. Marous quotes Gartner in closing his article; “Gartner predicts that by 2020, the customer will manage 85% of their relationship with an enterprise without interacting with a human. Get some help with your digital strategy – you’ll find technology suppliers, consultants, trainers and more in our Business Directory.